American Civil War-era art critics James Jackson Jarves, Clarence Cook, and William J. Stillman classified styles and defined art in terms that have become fundamental to our modern periodization of the art of the nineteenth century. In Critical Shift, Karen Georgi rereads many of their well-known texts, finding certain key discrepancies between their words and our historiography that point to unrecognized narrative desires. The book also studies ruptures and revolutionary breaks between "old" and "new" art, as well as the issue of the morality of "true" art. Georgi asserts that these concepts and their sometimes loaded expression were part of larger rhetorical structures that gainsay the uses to which the key terms have been put in modern historiography. It has been more than fifty years since a book has been devoted to analyzing the careers of these three critics, and never before has their role in the historiography and periodization of American art been analyzed. The conclusions drawn from this close rereading of well-known texts challenge the fundamental nature of "historical context" in American art history. "Karen Georgi's Critical Shift argues that the Civil War was less a disruptive dividing line between radically different artistic eras than a blip on an aesthetic continuum from the antebellum decades to the Gilded Age. To make the case, Georgi closely examines the influential writings of prominent art critics James Jackson Jarves, Clarence Cook, and William James Stillman and finds that the war had little or no impact on their ideas about what art should be and what role it should play in society. 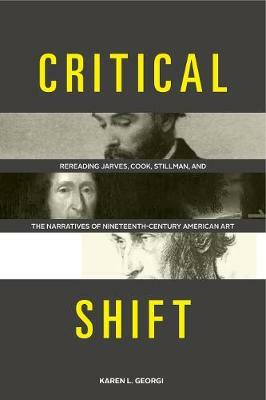 With its bold new challenge to the model of periodization that has shaped the history, and historiography, of nineteenth-century American art in the modern era, Critical Shift is a provocative contribution to the history of American art theory and criticism in the nineteenth century." "This study by Georgi, which draws together the ideas of three 19th-century art critics and commentators, offers a fascinating perspective that unexpectedly relates earlier concerns with those of a postmodern generation." "One cannot embark upon an analysis of how historical periodization took shape without being keenly aware of one's own historical desires and their enactment in writing; these thoughtful concerns inform Georgi's philosophy of history and undergird her historiographic enterprise. . . . Given the need for thorough, subtle, and complex analyses of historical art criticism in America, this investigation offers the tantalizing glimpse of what such projects might look like, if done with great restraint and attention to the intertwining of rhetoric and belief. The care with which she sets forth the boundaries of her study demonstrates how sensitive Georgi is to the failures any such 'comprehensive' study might risk in creating its own mythologized history."